Russian ambassador to UN, Vitaly Churkin. Russia's draft resolution to include Kurds in the forthcoming negotiations on Syria’s future at Geneva has been turned down by Western member countries of the United Nations Security Council. Vitaly Churkin, Russia’s Permanent Representative to the United Nations, has said that western member countries of the UN Security Council (UNSC) have vetoed Russia's draft resolution proposing to guarantee representation to all segments of Syrian society, including the Kurds, at the upcoming round of talks on Syria’s future, due to begin on April 11. 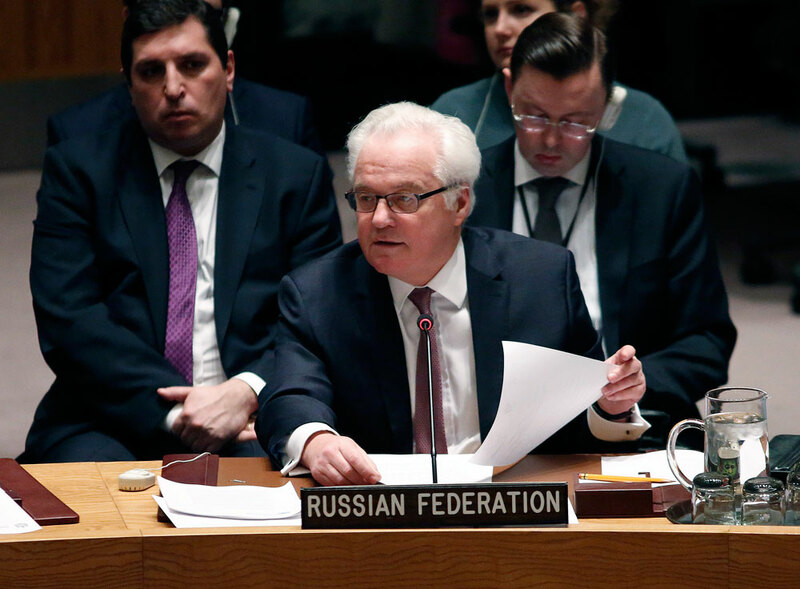 Churkin was speaking in an interview with the TASS news agency. Russia’s Permanent Representative could not fathom why the Russian initiative was not understood at the Security Council, emphasizing that "all segments of Syrian society" must participate in the political process. He added that the western countries' stance "contradicts UN Security Council resolutions on the inclusiveness of the political process in Syria." Churkin said the contradiction between Russia and the others arises from the fact that Russia is concerned that the Syrian Kurds have still not been represented as an independent delegation in the Geneva talks. Russian Foreign Minister Sergei Lavrov has already said that Russia would "strongly insist" that the Kurds participate in the political process to resolve the crisis. The Turkish government, which considers Kurdish organizations as terrorists, is against the participation of Kurds in the Geneva process. The Syrian Kurds have already declared the federalization of Syria and the creation of their own autonomous state in the country’s north in March. However, neither Syrian President Bashar al-Assad nor representatives of the opposition have recognized Kurdish autonomy. Vladimir Akhmedov, Senior Collaborator at the Institute of Middle East Studies in the Russian Academy of Sciences explained why it was so important for Russia that the Kurds are represented at the Geneva talks. "The Kurds, unlike many groups active in Syria, have an identity that is based on ethnicity, not on religion. They contain a powerful secular charge," he said. Akhmedov believes that, as a secular force that is not focused on religious divisions, the Kurds can become one of the keystones for the rebirth of statehood after the end of the civil war, especially as a part of Syria's future armed forces. "The Kurds are very good fighters and their formations constitute a major power," he said. Meanwhile, Akhmedov noted, the Western countries are afraid of supporting the Kurds because the latter wish to present themselves separately from the delegations sent by the Syrian regime and the opposition. "If the talks are held between the regime, the opposition and the Kurds, it means that they are a third force, a force that can make demands, including those concerning their autonomy. But for now the talks are about something else, about the establishment of peace in the country," he said. In Akhmedov's opinion, the solution to the situation can be having a part of the Kurds join the government delegation and a part joining that of the opposition. "In the end, they are also disunited: There are some among the Kurds that support the regime and some that are against it," he said.